“Broadside” summer history camps immerse children in 17th-century colonial Virginia and the American Revolution through stories, games, craft activities and visits to museum galleries and outdoor living-history areas – Powhatan Indian village, 1607 ships and 1610-14 fort at Jamestown Settlement, and Continental Army encampment and Revolution-era farm at the American Revolution Museum at Yorktown. Jamestown Adventurers, Ages 4-6: Are you ready to jump into the past and explore the daily life of Powhatan Indians, English sailors and children in the 17th century? Discover what life was really like in 1607 during these hands-on adventures. 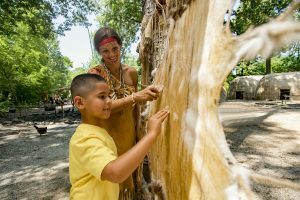 Over the course of three days, children will learn about animal tracks in the Powhatan Indian village, foodways of English sailors on board one of three re-created ships, and daily life for a Jamestown colonist in the re-created fort. Program Dates/Cost: June 17-19, June 24-26, July 15-17, 9:30 a.m. to 12:30 p.m. $63.00 per child for three-day session. Jamestown Discoverers, Completed Grades 1-3: Discoverers try their hand at 17th-century skills as they test their “metal,” develop tools and investigate the ways the environment challenged the colonists. During this three-day camp, children will learn about blacksmithing and metal work in the re-created fort, how Virginia Indians lived off the land in the re-created Powhatan Indian village, and 17th-century piloting and navigation of English sailors on board one of three re-created ships. Program Dates/Cost: June 17-19, June 24-26, July 15-17, 9:30 a.m. to 12:30 p.m. $63.00 per child for three-day session. Yorktown Adventurers, Ages 4-6: Adventurers jump into Revolutionary War history by testing their skills at the drop spindle and riding into Yorktown with General George Washington. This two-day camp allows children to learn how Revolution-era farmers produced their own fiber for cloth and about marching as soldiers in the Continental Army. Program Dates/Cost: June 20-21, June 27-28, July 18-19, 9:30 a.m. to 12:30 p.m. $42.00 per child for two-day session. 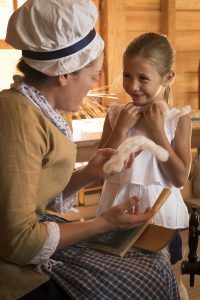 Yorktown Discoverers, Completed Grades 1-3: Discoverers learn how to make their own paper in the 18th century and cook up some fun on the Revolution-era farm kitchen. This two-day camp includes visits to the re-created Continental Army encampment to make paper and to the Revolution-era farm kitchen to mix up ingredients for a special dish. Program Dates/Cost: June 20-21, June 27-28, July 18-19, 9:30 a.m. to 12:30 p.m. $42.00 per child for two-day session. To register online for these summer history camps, visit https://bit.ly/2VcrJyT. For more information about Jamestown Settlement and American Revolution Museum at Yorktown summer history camps, visit https://www.historyisfun.org/learn/youth-and-family-programs/broadside-summer-history-camp/ or call (757) 253-4732.